Hello there, this is my first time on this site so I do not know if my question has been answered before. I am growing green chili's in a pot. Got some beautiful long green chili's off of it and very yummy. I saw 2 of them turning a different reddish color and thought great, I am going to have some red ones. But a few earlier were turning a weird color and were identified as being diseased. I don't know how to tell if they are turning red or are going to disease the whole plant?? Any advise? Thank you so much for your time. 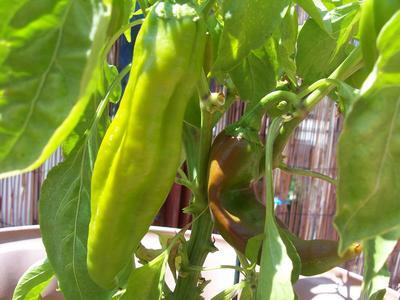 I had lots of green chilli peppers last year, the longer they stayed on the plant the redder they got. Mine were not diseased, I would let them stay on the bush like the red ones. Whoever identified your chili pods as being diseased should know what the problem is, yes, no?? The pods and plant in photo look healthy except a bit yellow, in which case feed the plant some food with nitrogen in it. Maybe one of the leaves on the right looks like it might has damage from any of the following, mites, aphids, thrips, whiteflies, and you would have to look very closely to see if anything is crawling around on underside of leaves. Hose or spray with organic mix if so, or pull off affected leaf or two. Potted plants need plenty of water when fruiting, and usually feeding every week or so as well. Be interested to hear what you do discover, and hopefully fix the problem.